Two dozen red roses. Is there any better way to show your love and appreciation for someone special? Whether it’s Valentine’s Day, a romantic birthday, a special anniversary, or a memorial tribute, there is no better way to say something so simple then Rose Rhapsody. 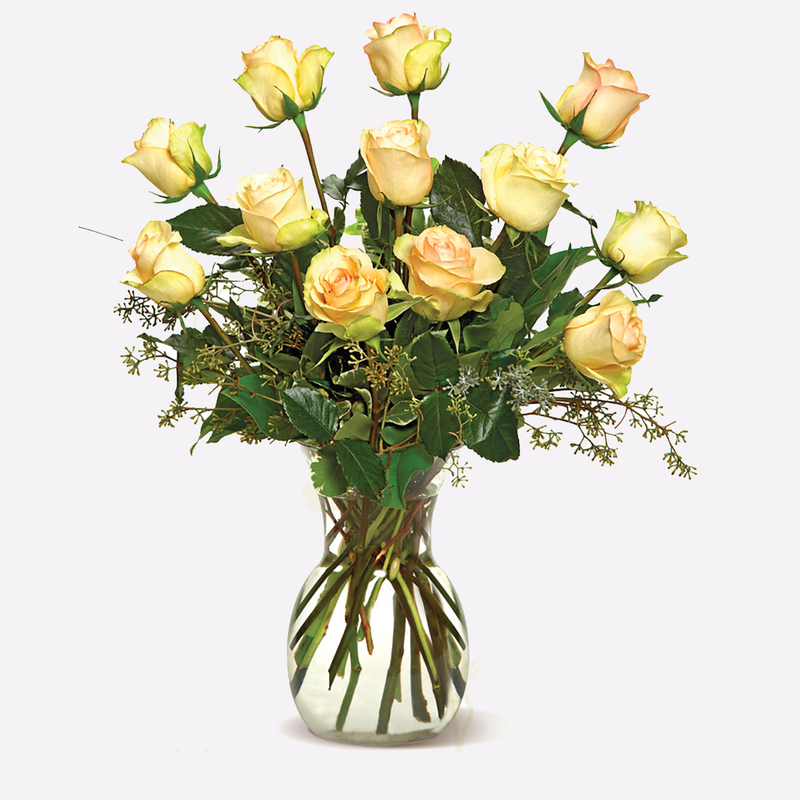 The power of two dozen gleaming roses is in the way they draw attention in any room. The way the roses fan out in an elegant display is a breathtaking sight that cannot be missed. Neither can the intentions of the sender. 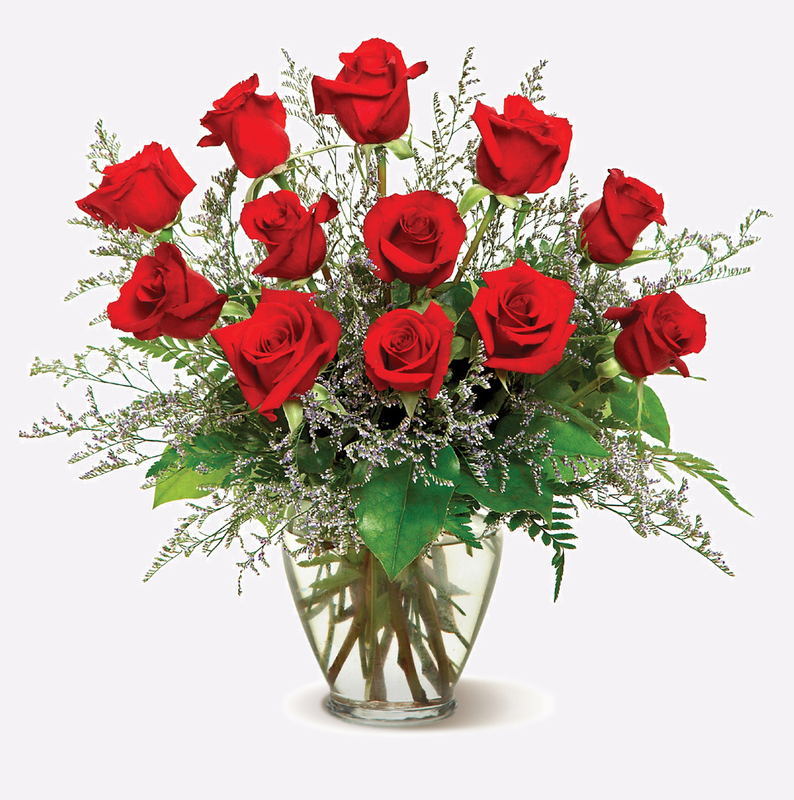 Each arrangement includes two dozen fragrant, long-stemmed red roses accented by tasteful greenery, sending an unmistakable message of love and adoration. Please note: you must call to request other colors (212) 302-4090. Shop is closed. You can make order with delivery tomorrow starting at 09:00 AM. A dozen gleaming red roses send that message in a multitude of ways. They send love to those you wish it upon. But they also say I’m sorry in the most thoughtful way. They wish a happy birthday to someone you want to feel special. They say happy anniversary perfectly. And they share thoughts of affection and appreciation, just because. 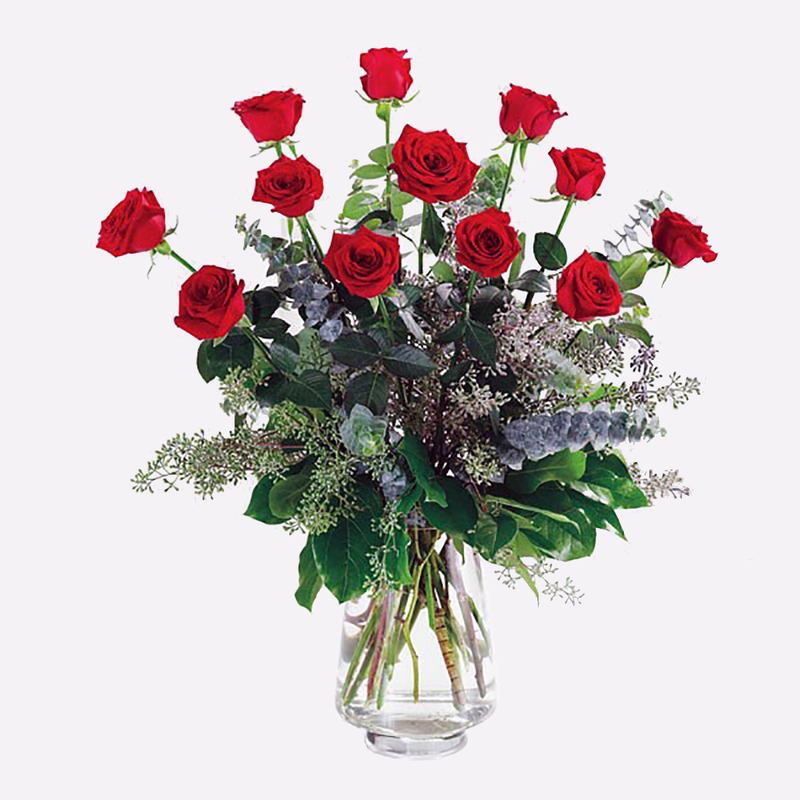 The roses are accompanied by seeded eucalyptus, spiral eucalyptus, and salal tip to give the arrangement depth, creating a picture of charming beauty. Like an unexpected breeze on the nape of your neck on a hot day, Rose’s Breath is a surprise sensation that tingles your senses and makes you smile with anticipation of what’s to follow. 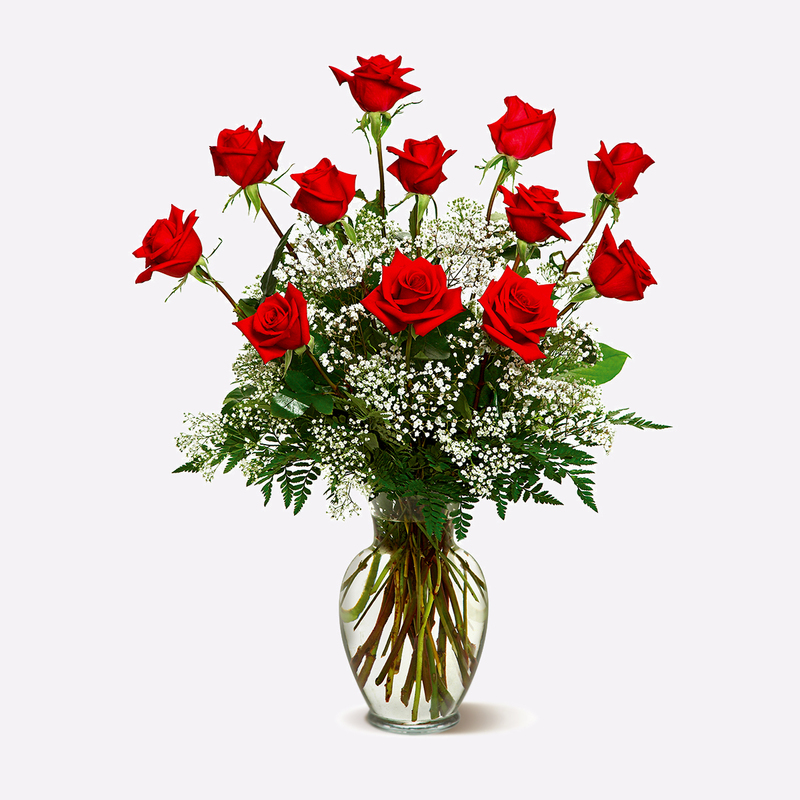 The iconic arrangement of one dozen red roses adorned with a classic mix of white baby’s breath and ferns sends a simple but very effective message of love. Whether it’s Valentine’s Day, a birthday, an anniversary, or just a day to send someone a little love, Rose’s Breath will arrive in their life on the winds of affection and a gust of good will. Sometimes, when it comes to sending flowers, you don’t want all the pomp and circumstance. Sometimes, you just wanted to send a very simple and direct message that cannot be misconstrued: I love you. There is nothing more simple and direct than Romantic Roses. This charming bouquet featuring a dozen fresh and fragrant red roses, adorned with just a bit of classic greenery, does not mince words or feelings. It greets your loved one at the door with an unmistakable missive meant to overwhelm their senses. 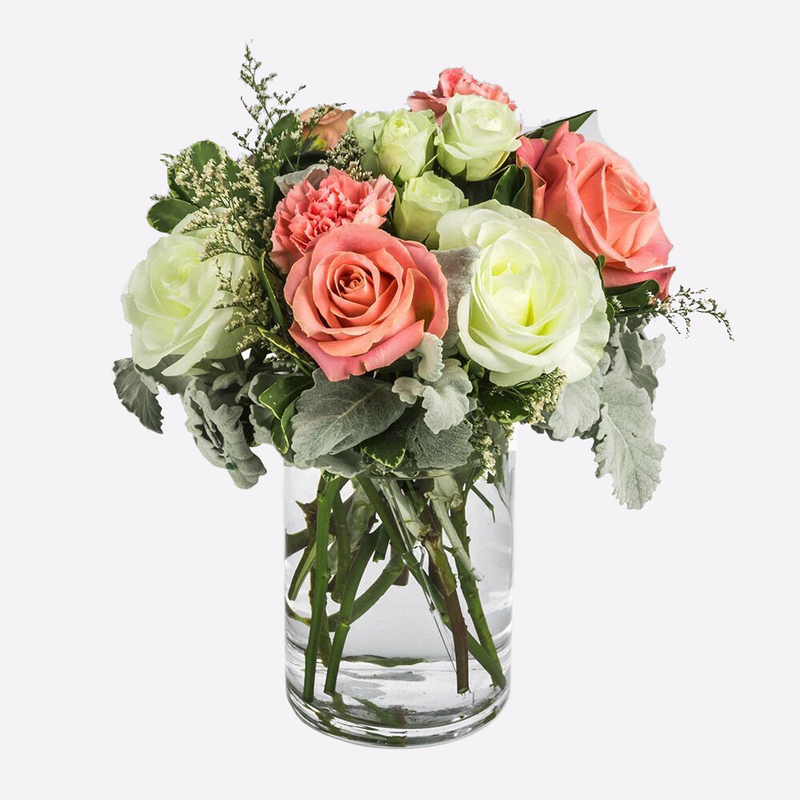 Delivered in a clear glass vase, this straightforward arrangement is a classic Valentine’s Day gift but also sets a romantic standard for any day or special moment of the year. All due respect to red roses but sometimes you want to send something with a slightly more creative look. An arrangement of roses is bit a like a love letter and in that sense, these bi-colored roses recite for the one you love a Two-Tone Poem. The two-toned petals of these special roses make an artistic statement and tell a unique story. They add a multilayered message to the message you’re sending and tells a not-so-subtle story of how much this person means to you. They’re as layered and particular as these flowers are, whether you’re letting them know how much you care, how sorry you are, or how much you love them. The bounty of a beautiful garden brought together in a single bowl. Garden Grace brings some of the finest and most striking flowers from the backyard and puts them in an easy to display bouquet that tells someone that they’re as special as the contents inside this collection. This bright bowl arrangement includes the colorful blossoms of delphinium, gerbera daisies, lilies, lisianthus, mini calla lilies, and snapdragons. 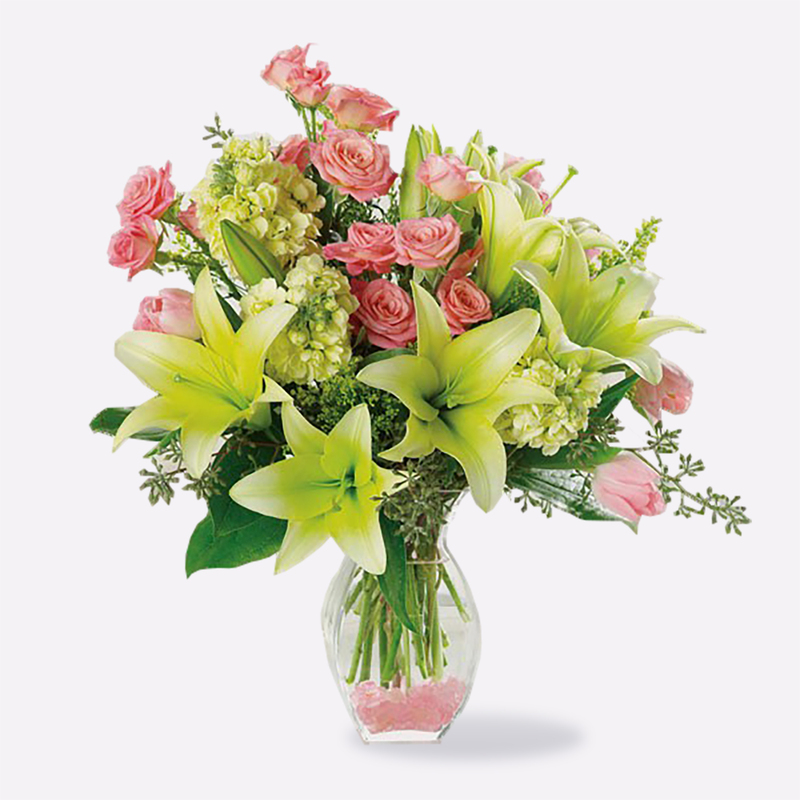 An assortment of pink, green, and lilac flowers that makes for a wonderful centerpiece whether you want someone to get well soon or enjoy their special day. Springtime is a time of renewal, fresh starts, and the beginning of something new. Is there any idea that sums up the senses of this feeling quite like Budding Romance? 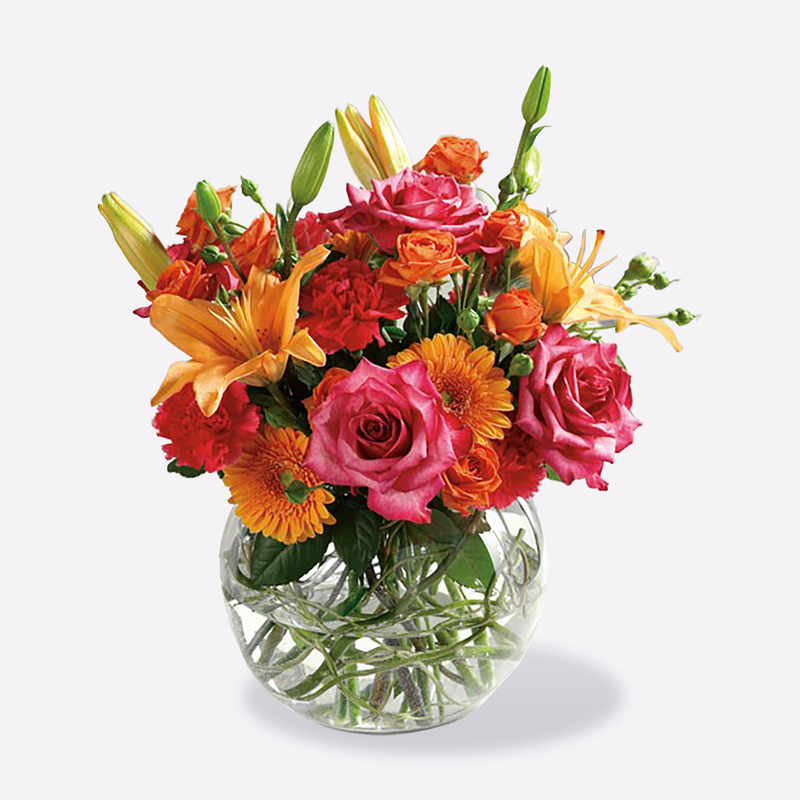 Whether it’s the cheery start of a special relationship or an appreciation of life’s brightness, this arrangement will help you create happy memories of sweet thoughtfulness. This collection of Oriental lilies, roses, and tulips spreads joy wherever it goes and to whoever it reaches. Vibrant pinks and yellows also make for a perfect Easter or Passover message of hope. Please note the vase will be similar to picture but pink stones may not be available. For romance, friendship or just to show that you care, this Blushing Beauty of a bouquet will lend a touch of glamour to any room. Splashes of color couple with notions of natural elegance to conceive of something special. 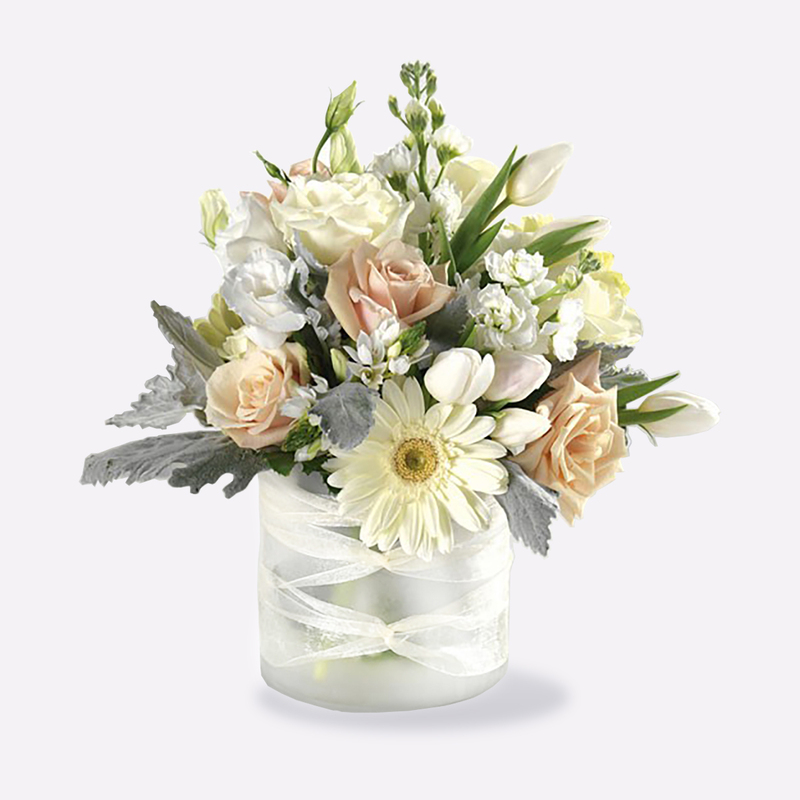 This medley of gentle blossoms includes roses, carnations, delphinium, and gerbera daisies, all nestled inside a cylinder vase, creating a gorgeous gift and creating an instant moment to cherish. Blushing Beauty is perfect to say so much, whether it’s Happy Mother’s Day, to celebrate Easter and Passover, to tell someone you’re sorry, or wish them a happy birthday and congratulations. It is one thing to look up upon the stars. It’s another thing to look up and wonder about what makes them twinkle and how magical it is that we’re connected to them. With that notion in mind, consider sending someone you care about To The Stars! There’s no better flower to invoke that idea than Stargazer lilies so they’re front and center here. 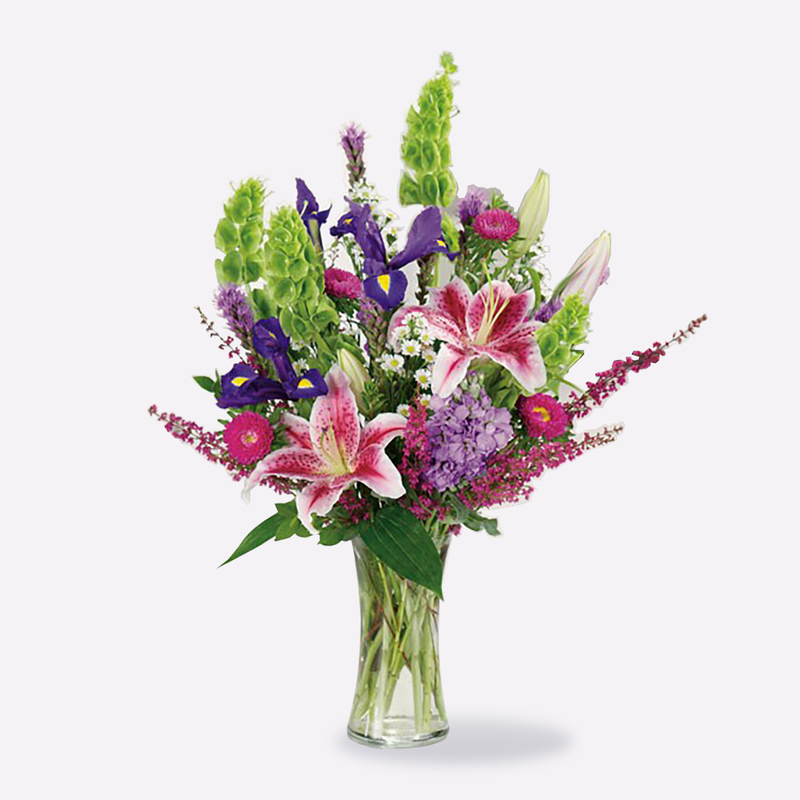 Coupled with Bells of Ireland, irises, and aster, the bouquet created is just as heavenly as what lies above. Consider this collection of bright colors next time you want to send a message of love, wish someone well, welcome spring or summer, or say Happy Mother’s Day. Ever look out on a garden and wish you could collect up every gorgeous flower, package them up, and send them off to someone special? Your wish has been granted. 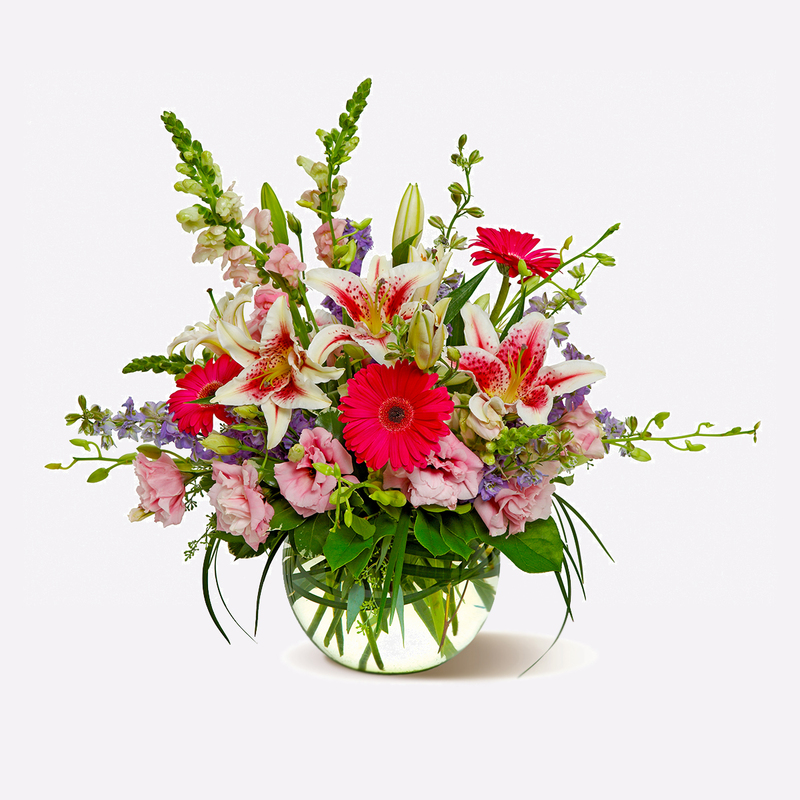 Flower Medley is the ideal surprise for the person in your life looking to bring a beautiful garden into their home. This splendid medley of blue, cream, white, pink and lavender flowers, presented on a bed of river rocks, is the kind of creation that begs to be explored with the senses. The collection of carnations, delphinium, dianthus, and roses offers up so many textures, types, and tints to traverse. A wonderful gift just because, Flower Medley also sends warm tidings for any holiday, birthday, anniversary, or just to say I’m sorry. In Roman times, important days were marked in red on a calendar. In Medieval times, words were highlighted for emphasis written in red ink. 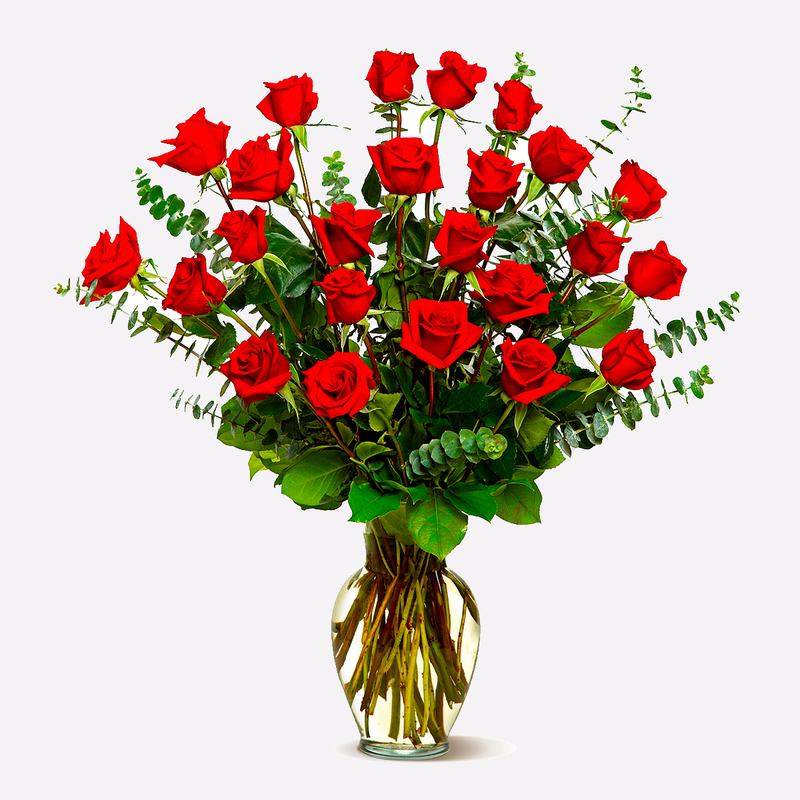 The Red Letter Day remains a way to say that today is a very important day, which is exactly what the recipient of this arrangement will feel. Boasting a ‘Razzle Dazzle’ rose, Gerbera daisy, and red hypericum, this bouquet tells the person who recieves it that this special day stands out because of you. They’ll be seeing red, but in the best possible way. 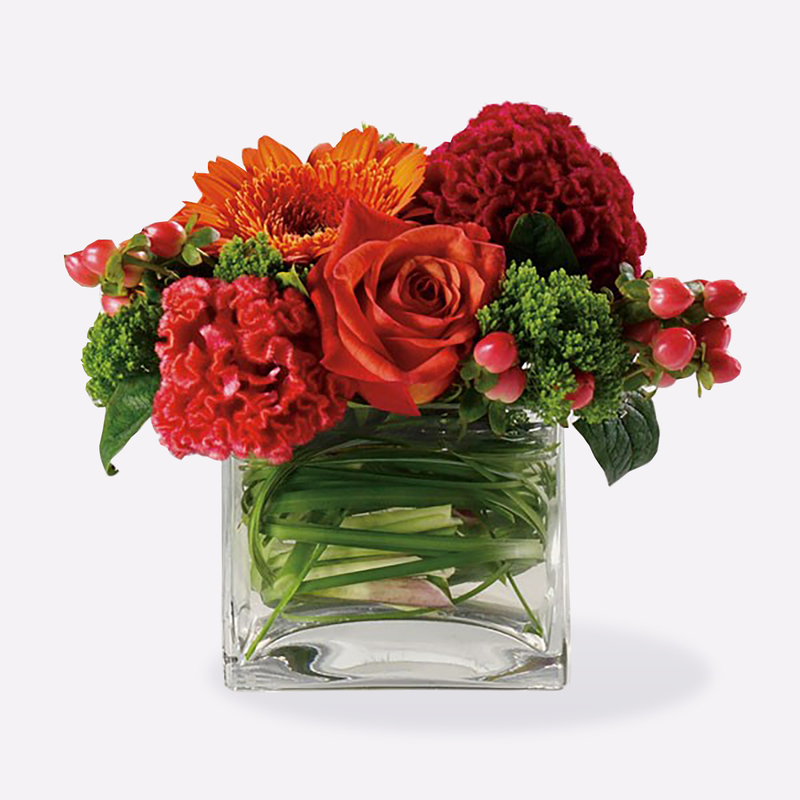 While red lends itself to love and romance, this arrangement is also ideal for birthdays, anniversaries, congratulations, and just because. Pure beauty. Pure innocence. Pure intentions. Whoever you send this arrangement to, you can be assured that it’s message will be unmistakable. Such is the power of Pure Passion. This dreamy collection of pearly whites, delicious creams, and pastel blooms offers an elegant vision of appreciation. Just looking at it inspires warmth while the sweet scent delivers a purely wonderful experience. 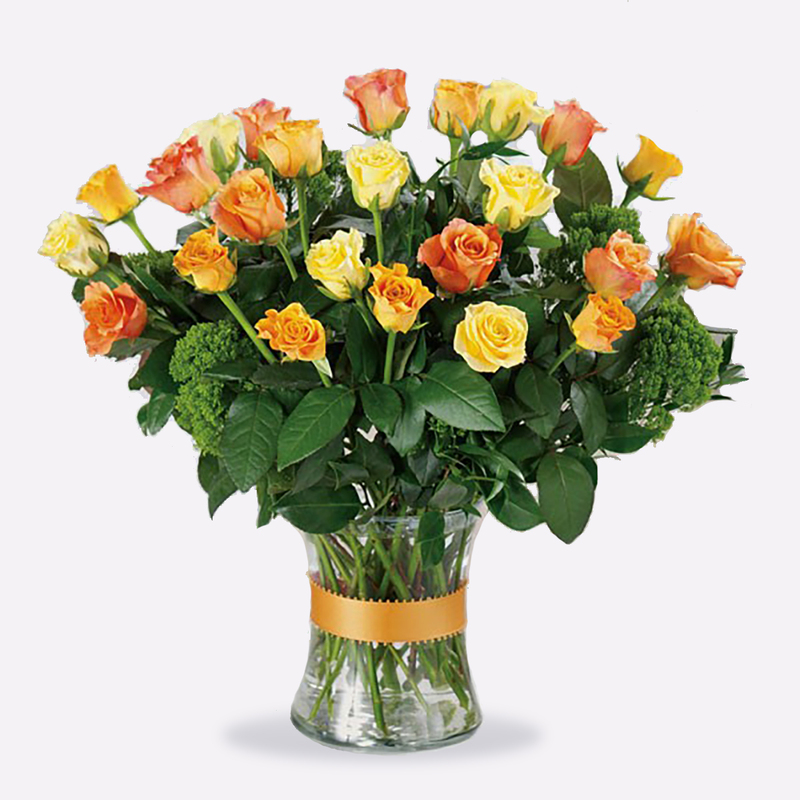 This bouquet of gerbera daisies, roses, and tulips is an ideal gift to say I’m sorry, get well soon, congratulations, or offer sympathy. Please note that a clear glass vase if similar size may be substituted. Consectetur adipiscing elit. Nam tristique lectus sollicitudin ligula fringilla suscipit. Aenean elit diam, iaculis consequat turpis ac, vestibulum venenatis dui. Ut aliquet egestas lorem, non ultricies arcu vulputate sed. Curabitur sollicitudin consectetur arcu in consequat. Pellentesque sed interdum nunc. Mauris dolor lacus, egestas nec suscipit sit amet, consectetur sed urna. Vivamus iaculis dictum libero, eget ultricies ex tempor vel. Ut molestie sapien mattis augue tristique luctus. Curabitur gravida dolor ut libero consectetur, eget interdum diam vulputate. Nulla feugiat, arcu sit amet varius venenatis, justo felis fringilla turpis, vel congue libero erat vitae ipsum. Fusce ut imperdiet metus, quis fringilla erat. Sed quis dictum nulla, eu pharetra ipsum. Fusce viverra ut massa at lacinia. Integer non augue mattis, lacinia magna quis, viverra elit. Proin vulputate mattis neque, sed ullamcorper nisl ultricies eu. Etiam dignissim sodales justo, vel efficitur turpis lacinia nec. What’s more exciting than seeing a ball roll your way? You’re instantly a kid again, excited by the possibilities and anxious to have fun. The Flowerball bouquet works in the same way, showing up at someone’s doorstep with promises of boisterous, merry good times. What an impression this ball makes. Stunning roses, Gerbera daisies, lilies, and carnations light up any room and evoke a brightly bound wonder that will make anyone smile. Flowerball makes the perfect delivery whether you’re trying to send a message of love, congratulations, sympathy, or just because. Do you know someone in need of a little pick-me-up? Don’t just lift their spirits, rocket those spirits into the sky with Grandeur Garden. This charming display of blushing blossoms arrives in shades of pink, red and purple. Eye-catching carnations, ravishing roses, and stunning Stargazer lilies are sure to sweep anyone into a surreal state of serenity. Grandeur Garden isn’t just for those who need a little lift. It’s also an ideal arrangement to send some love, for a birthday or anniversary, or just because. It’s also something wonderful to celebrate the sunny season. Ice cream. Cream cheese. Whipped cream. Crème fraîche. Whatever the connotation, cream just calls out decadence, pleasure, and delightfulness. No wonder that our Crème de la Crème arrangement is such a sought-after bouquet. One dozen cream roses say so much in a simple way. They speak of gratitude and appreciation. They can also send sympathy. 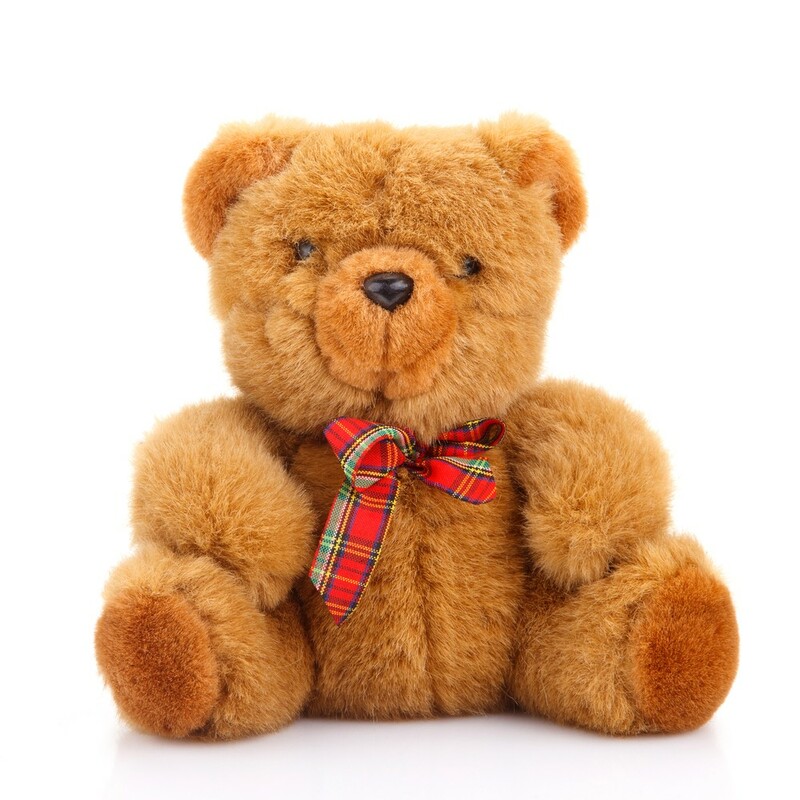 Whatever the occasion, it’s a warm and thoughtful gift for someone to receive. 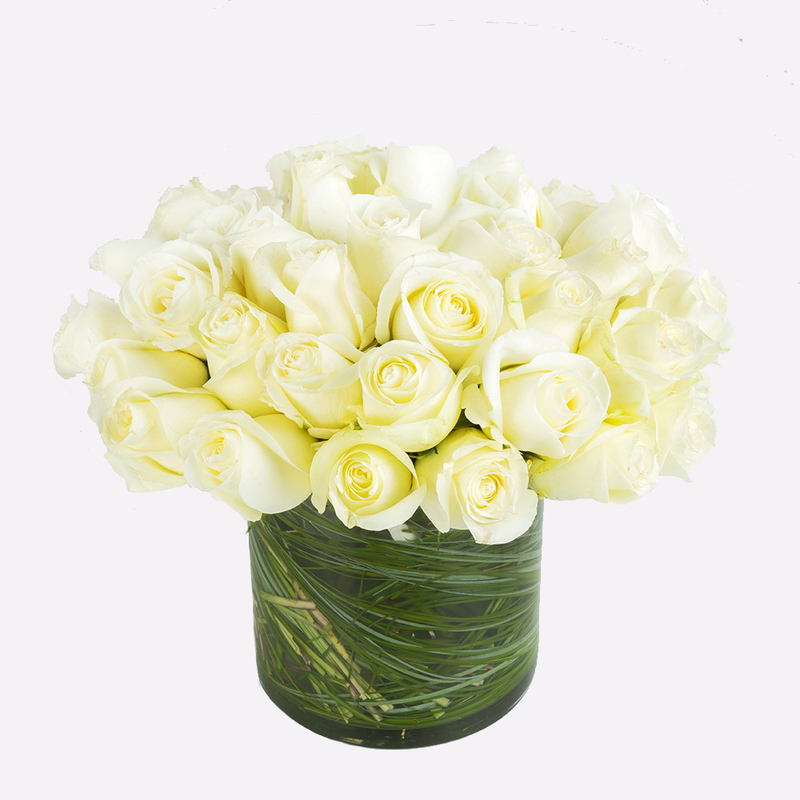 Please note that solid white roses may be substituted if cream colored roses are not available. 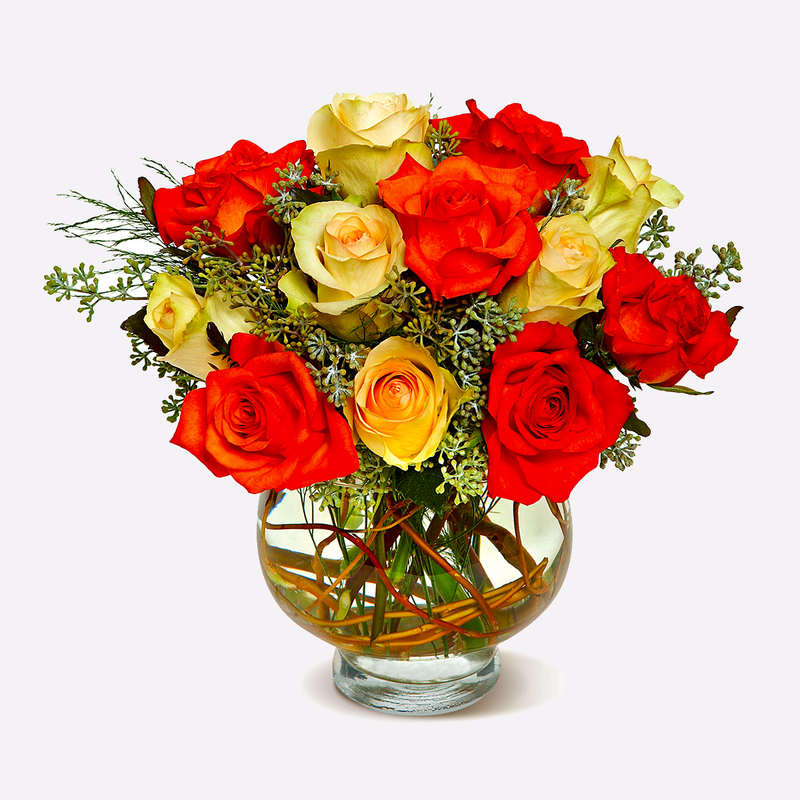 All due respect to red roses but the orange, yellow, and golden roses of this bouquet bring a sumptuous energy and joyful burst of color to any occasion. A mix of contemporary and classic, we suppose you could call this one Gold Fashioned. 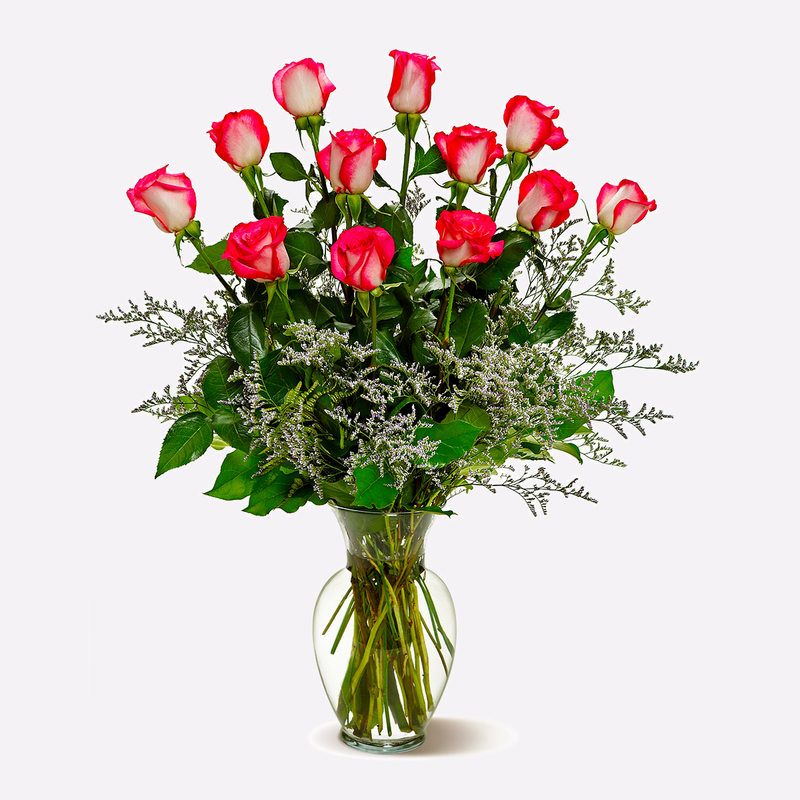 A magnificent arrangement of 24 specialty roses and green dianthus dazzles upon arrival. Whether you’re sending love, condolences, congratulations, or well wishes, you’re sending a stunning array sure to warm whoever receives it. 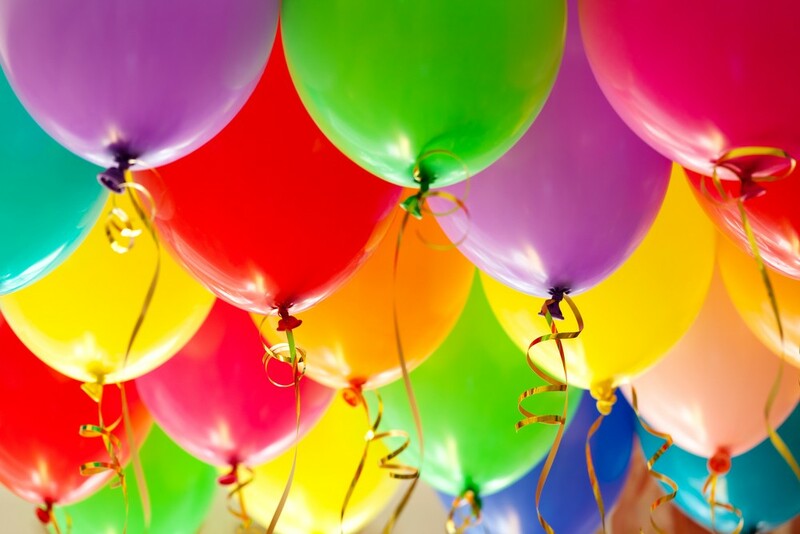 Please note that you must call us for other colors – (212) 302-4090. Picture This: A fun, festive mix of pretty pink blossoms, including fancy fresh flowers such as roses, lilies and stock, in complementary blushing tones. We suppose we meant to ask you to Pink-ture This. This magnificent display is a lovely gesture for a birthday, anniversary, or other special day. All that pink just keeps popping long after it shows up. Consider professing your pink-hued appreciation for someone today. The searingly bright pink flowers of this arrangement are sure to leave you saying we Gotta Get Gerberas. You might want to keep them for yourself but the fun is sending them to someone special and hearing how these hot pink petals fired up their day. This bouquet adds a bit of pop art prettiness to any room. 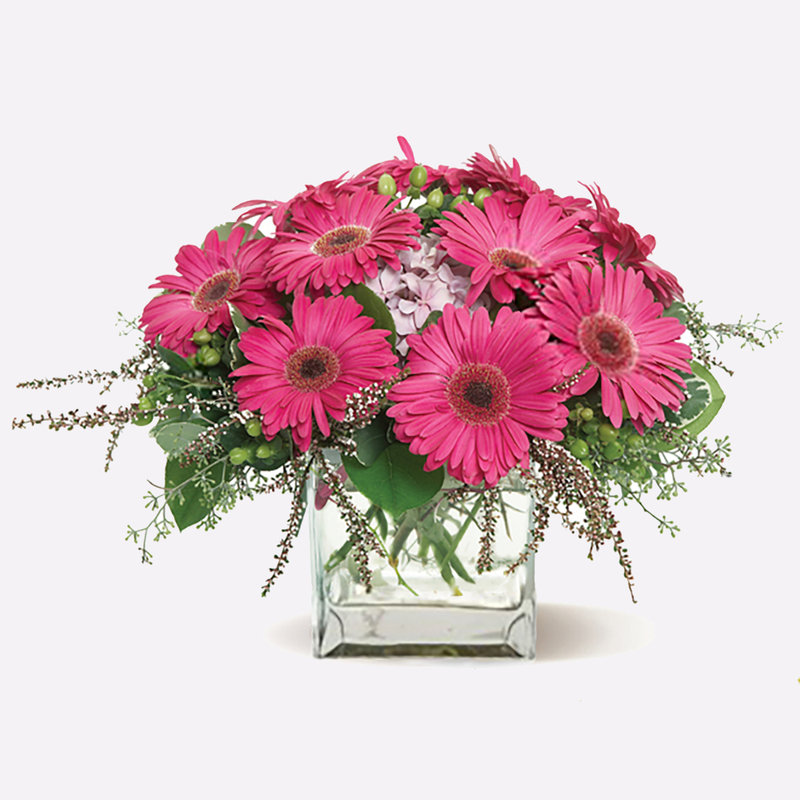 Hot pink gerberas are accented with a mix of greenery and pink blooms. This bouquet is both fun and fabulous for just about any occasion. “My bounty is as boundless as the sea, My love as deep; the more I give to thee, The more I have, for both are infinite.” Just as Juliet professes her love to Romeo from the balcony, you too can offer a sincere appreciation of someone special with the Romeo and Juliet bouquet. 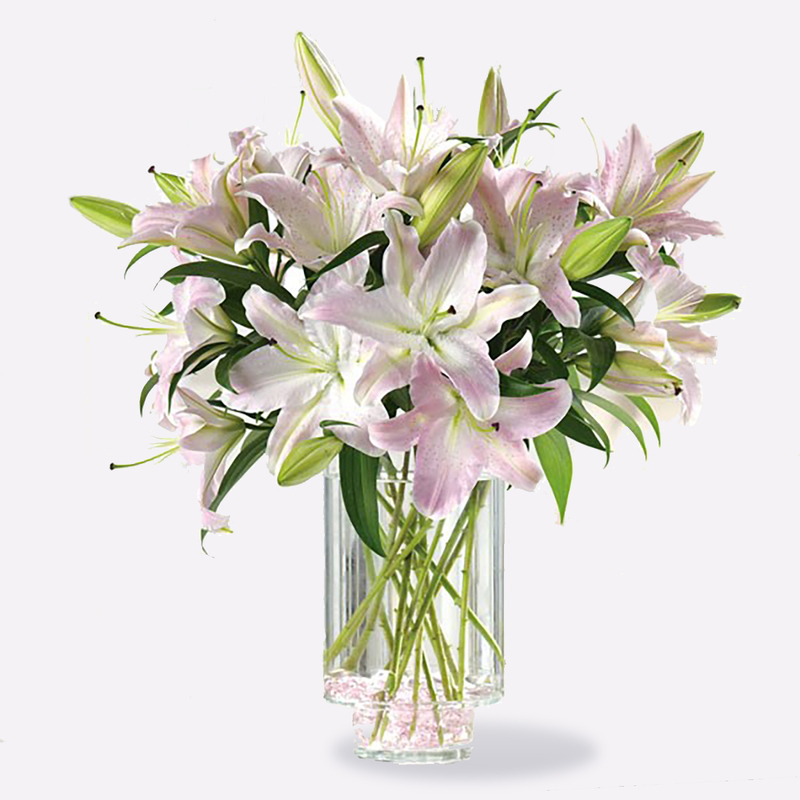 Red roses and pure white lilies are two of the most elegant blossoms in nature; combined in one lovely floral arrangement, they bring together the best of both worlds. A simple and elegant display for star crossed lovers, or anyone else as well. The colors and arrangement also speak volumes to say I’m sorry, send birthday cheer, or send flowers simply because. Snow gathers as it rolls downhill, growing bigger and stronger until its power and beauty cannot be contained. The Snowball glistens brightly, looking for someone to share it’s pristine perfection with. 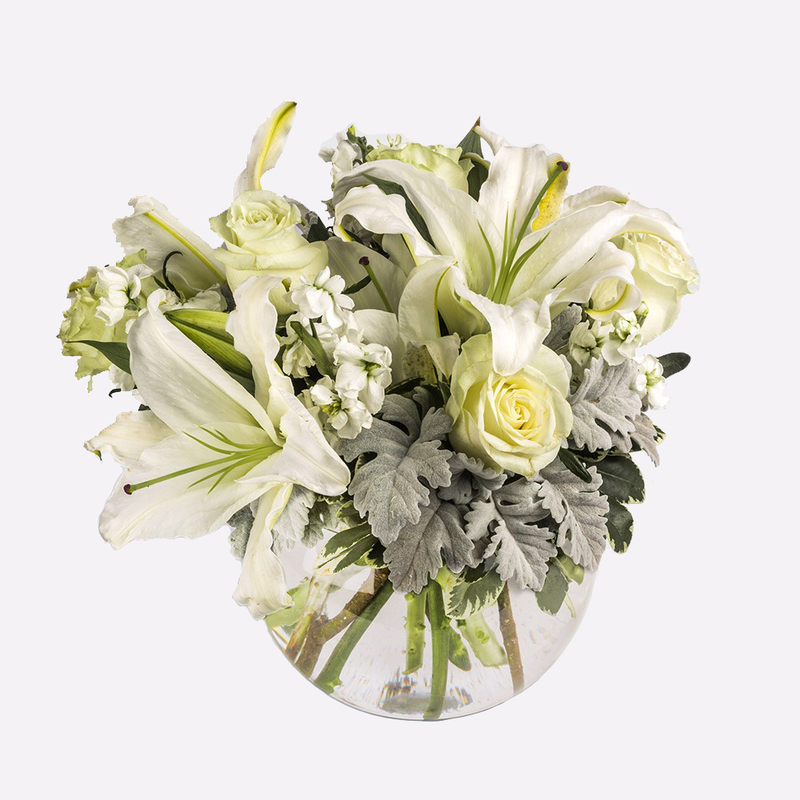 This arrangement includes white roses, white asiatic lilies, white stock, and dusty miller. There is so much going on and yet there is so much simplicity in what it says. Send your condolences or sweet thoughts with Snowball. What’s better than a single white phalaenopsis orchid? Two white phalaenopsis orchids, of course. 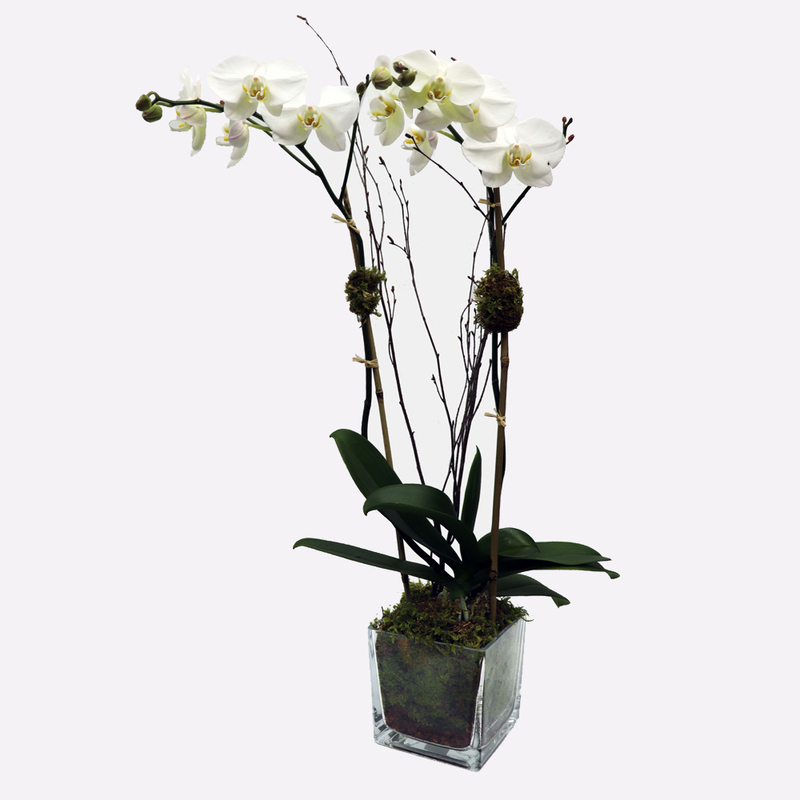 The Double Orchid Plant in a glass vase with green moss is a timeless image of nature’s quiet beauty. This elegant presentation is an appropriate gift for any occasion, from Mother’s Day to an anniversary to saying sorry. The orchids are also available in purple, but please mention under “instructions” if you would like this double orchid in purple. Sometimes all the fancy flourish and flashy florals in the world miss the point. That’s when you need something simple that says just as much. You need something Sweet and Neat. This arrangement includes pink roses, white roses, pink carnations, and dusty miller. It’s the perfect balance of color, calmness, and glam. Just enough to entice, but not too much. Sweet & Neat is the perfect gift for a birthday, thank you, or just because. White roses symbolize hope, honor, adoration, and innocence. They convey respect, pay homage to new starts, and express hope for the future. Suffice to say, sending someone Two Dozen White Roses means you’re sending them all of that and more. This elegant and deceptively simple design makes a bold statement. It also stands out from the crowd of red roses that we’re all so accustomed to. Two Dozen White Roses is the perfect gift to welcome new beginnings, honor a loved one, celebrate an anniversary, or show your respects. Lilies and love go hand in hand. They are patient, dependable, grow with care and attention – and they selflessly wish to make you happy. That’s what makes Lily Lovers such an ideal gift for anyone who needs a little love in their life. 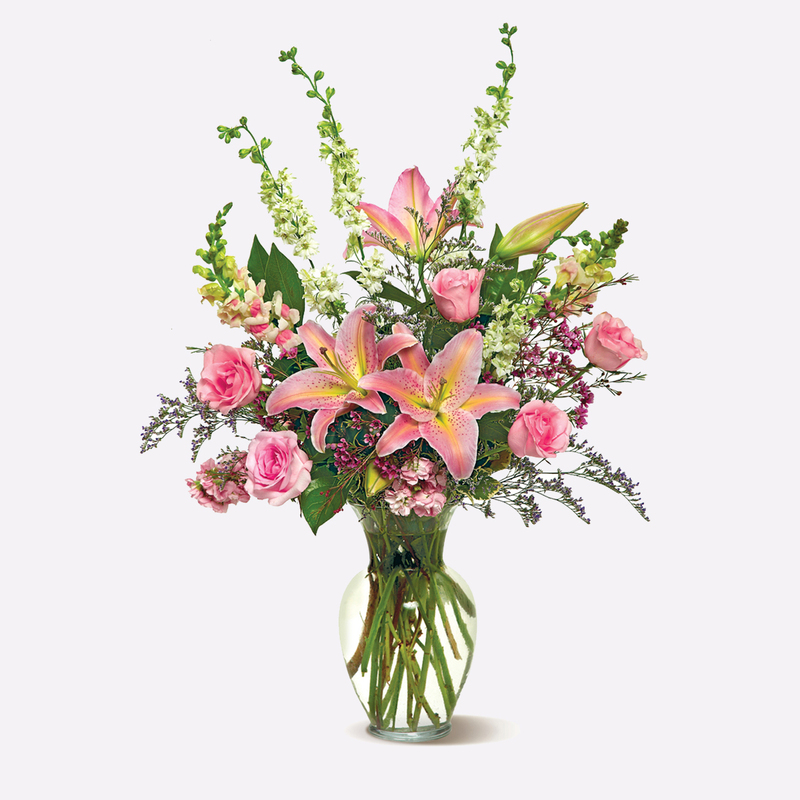 The dramatic design of this arrangement features pink Oriental lilies nestled in pink “crushed ice.” When this arrives at your door, love follows with it. That’s what makes it such a versatile bouquet, perfect for birthdays, anniversaries, new babies, Mother’s Day, or just because. Please note, the vase will be clear and a similar shape as the picture.